Just hours after giving us the cover, the tracklisting to Meek Mill’s anticipated Dreams & Nightmares debut has been revealed. The 14-tracks are lead by the singles “Amen” with Drake, and the newest offering “Young & Gettin’ It” featuring Kirko Bangz. 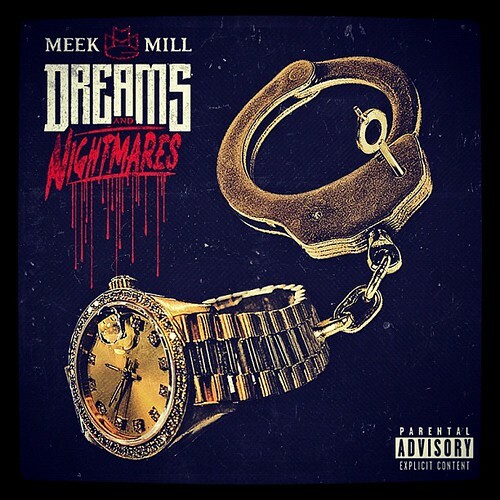 Meek’s first album provides a balance of solo cuts along with high-powered features such as “Maybach Curtains” with Nas, John Legend, and Rick Ross, plus “Who You’re Around” co-starring Mary J. Blige. 2 Chainz, Trey Songz, Wale, and Louie V round out the features, while production is handled by Cardiak, Boi-1da, Key Wane, Jahlil Beats, Kane Beatz, and Lee Major. You can pre-order Meek’s debut right now before it arrives in-stores on October 30th. Check the full lineup, plus production credits after the jump…. UPDATE: Deluxe songs added, pre-order on iTunes now. OOOOH THIS DISC GONA BE A HUGE FLOP LOL … NO WAYNE, DRAKE (NEW TRACK), NICKI, KANYE OR JAY-Z TRACKS TO PUSH THE ALBUM. NO DR DRE, NO I.D, HIT BOY BEATS LOL. WHAT IS THIS GUY THINKIN DONT HE KNOW MMG LIVE ON BIG NAME FEATURES TO GET NOTICED/SELL (HENCE THE MMG FANS RAVING BOUT TRACK 6). LOL HE GOT LOUIE V, KIRKO WANKS AS FEATURES LMAO. OMG THIS IS GONA BE A DISASTER WAITING TO HAPPN, ITS LIKE WATCHING A FINAL DESTINATION MOVIE SCENE BEFORE THE ACCIDENT HAPPENS, AND YOU JUST WAITIN TO LAUGH AT HOW THEY DIE. LIKE HOW ROSS GONA LET GO HIS MAN LIKE THAT ON HIS DEBUT ALBUM … YIIIIIIIKES !! Aint know one checking for MMG without the features man GTFOH with this mixtape tracklist cover. Is this some kind of joke ?? no big name features no Staley ? You’re judging way too hard off a tracklist. These features actually make sense, not Nicki, Kanye, Wayne or Jay, this isn’t a Ross album. Did Wale have any of them on Ambition? No, and it was still decent. It sounds like you’re just praying for this album to fail.